Life hacks are necessary for caregivers who must find ways to squeeze different responsibilities into their day. While coming up with new ways to do things can help your loved one stay independent, it also frees up your time. Consider adding these tips to your caregiving plan to streamline your daily routine. Bendy straws aren’t just for kids. In fact, flexible straws were first bought by hospitals because the nurses quickly realized how they made it easier to drink beverages from a hospital bed. These straws also work great for seniors with limited hand strength since they can lean toward a drink rather than having to lift the whole cup. If providing care for your loved one has become too challenging and you need assistance, consider hiring a dedicated caregiver. Families who need help caring for a senior loved one can turn to Home Care Assistance, a leading provider of Sacramento, CA, home care. Services available in our customizable care plans include meal prep, mental and social stimulation, assistance with personal hygiene tasks, and much more. Seniors sometimes have difficulty gripping thin objects such as the handle of a fork or a toothbrush. Help your loved one get a grip by slipping the foam portion of a roller set over the handles. This widens the handle, and the foam provides a nonskid surface that can help your loved one avoid dropping the object. When a senior is in a wheelchair or has limited arm mobility, reaching clothing in the closet becomes more difficult. If possible, lower the rod to a reachable level. If the rod is permanently attached in one position, hang a hanger on the rod, put the clothing on a separate hanger that you then hang from the first one. This helps make getting dressed independently easier for seniors. Zippers are a wonderful asset for clothing that many seniors find easier to fasten than traditional buttons. However, your loved one may still find it difficult to grab the thin surface of a zipper. To make it easier, loop string through the circle at the end of the zipper to create a longer area for seniors to pull on. Making separate meals each day takes up a lot of time. Cut your prep time in half by using an electric vegetable chopper to cut up enough ingredients to last for a week. Put these into individual containers you can freeze or refrigerate until you are ready to use them. Consider hiring a professional caregiver if your senior loved one needs help with meal preparation. 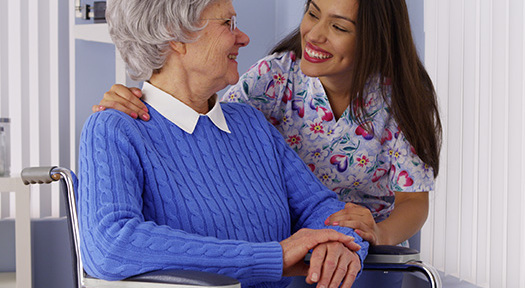 Sacramento -respite care professionals can assist seniors with a wide array of daily tasks, offering family caregivers the chance to focus on other personal responsibilities or take a break to prevent burnout. Whether it’s for a few hours a day or a few days a week, respite care is the perfect solution for family caregivers who are feeling overwhelmed. Family caregivers often forget to establish a unified way for all caregivers to communicate. When you have professional caregivers helping with your loved one’s care along with other family members, things can get confusing. Find an area in your loved one’s home where you can set up a calendar, care journal, and anything else you need to make sure everyone is on the same page. Trips to the doctor generally lead to long waits for seniors and their caregivers. Keep a bag in your car with items such as a change of clothes for you and your loved one, water, and snacks. A music player and headphones, books, and word puzzles are also great things to add to help you pass the time in the waiting room. Hiring professional caregivers is another important life hack family members should consider. Professionally trained caregivers can assist seniors with an array of daily tasks and offer respite to family members. If your senior loved one needs hourly or live-in care, Sacramento Home Care Assistance can help. Our caregivers can assist with exercise and mobility, prepare nutritious meals, provide timely medication reminders, and help with a wide array of other important daily tasks. To learn about our high-quality senior care plans, give us a call at 916.706.0169 today.